When the Sunoco Ferrari 512 M first appeared at Daytona in 1971 it was a revelation. Manned by a dream team that included owner Roger Penske, chief mechanic John “Woody” Woodard, and drivers Mark Donohue and David Hobbs, the car combined Ferrari’s pedigree with Penske’s legendary attention to detail in everything from his crew’s uniforms to the polished wheels. Slated to run at Daytona, Sebring, Le Mans, and Watkins Glen, this 512 M was the odds-on favorite every time the Penske team rolled it onto the starting grid. In a historic run of bum luck, however, the car never won a single race. Debuting at the 24 Hours of Daytona, Donohue put the 512 M on the pole. Just before midnight, however, Vic Elford blew a tire on his Porsche 917 and in the ensuing slowdown, Charles Perry and his 911S ran into Donohue and the 512 M. The Penske crew taped and patched up the car as best they could and watched Donohue and Hobbs fight their way back to a third place finish. Next up was the 12 Hours of Sebring, where the 512 M was once again on the pole. In the fourth hour of the race, away from photographers’ cameras, Pedro Rodriguez, driving a Porsche 917, rammed Donohue multiple times, sending the Ferrari into the pits for repairs. Once again, the pit crew managed to get the car back on the track, where it finished sixth. Shipped to France for the Le Mans 24 Hours, the Ferrari 512 M was considered an underdog against the long-tailed Porsche 917s, which had a speed advantage over the Ferrari. 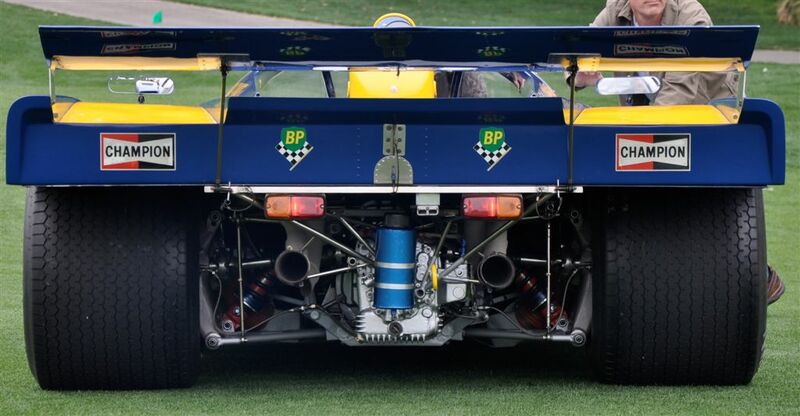 Alas, the Sunoco team barely got a chance to prove itself: the 512 M retired with engine failure on Saturday evening. Finally, it was back to the United States for the Watkins Glen 6 hours. Donohue was leading in the 54th lap when a broken steering knuckle sent him into the pits and out of the race. The Penske team came back the next day to run the car in the Watkins Glen Can Am race but the car’s original racing days were over. Despite its misfortunes on the track, the Sunoco Ferrari 512 M and the team that ran it remain among the most important racing stories of the 1970s. At a time when racing teams paid little attention to “spit and polish,” Roger Penske demanded that his cars and his teams be precise, disciplined, and spotless. Remove bad luck from the equation and this insistence on excellence would’ve paid off. As it is, it still changed the world of motorsports, as other teams quickly realized that they would have to change their own operations if they hoped to compete successfully in the long term.